Introduction by Jacques Dupont LThe following comments and marks were given to wines tasted between the 18th of March and the 19th of April 2013. Five weeks were spent tasting the wines once, twice or sometimes several times if in doubt. Five weeks is a lot but it’s also very early as the wines are not finished and still need to undergo the crucial ageing phase which lasts from 12 to 24 months. 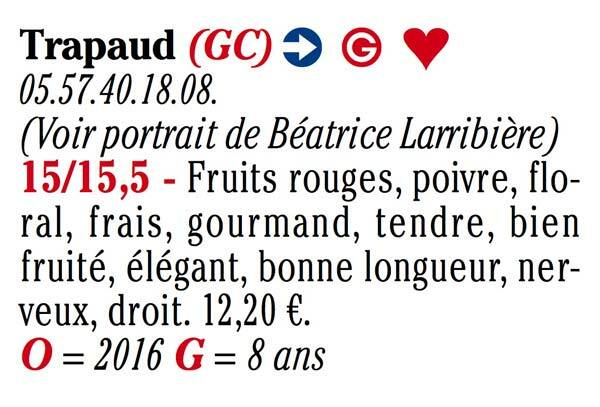 The information provided here should be considered as a guideline for primeur purchasing, a kind of childhood photo, rather than definitive tasting notes and opinions. Wines are marked out of 20 and according to the vintage. Wines are marked according to their category. 17 out of 20 awarded to a generic Bordeuax cannot be compared to the same mark given to a Latour or Margaux. Vintage marks: 17/20 for Pomerol reds, 16 for Saint Emilion and Pessac, 16 for dry whites. Appellation: Pomerol, for its maturity and smoothness. Words of the year: flowering, in the rain and cold of late Spring, was staggered over a period of time resulting in the heterogeneity of the harvest, with pink and green berries next to ripe ones. 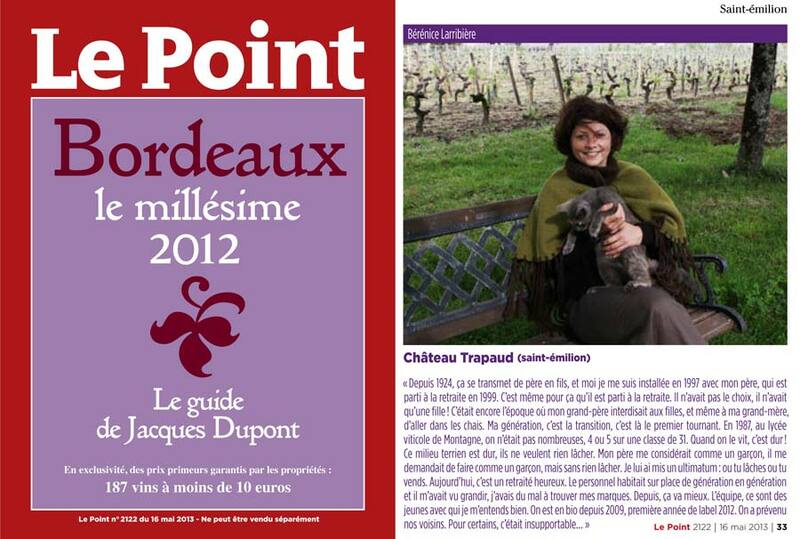 On behalf of the team at Château Trapaud, I would like to thank Le Point, Jacques Dupont and all those involved in this special edition publication. We could not have expected such positive feedback for our work and we are deeply touched by the tasting notes and marks awarded. 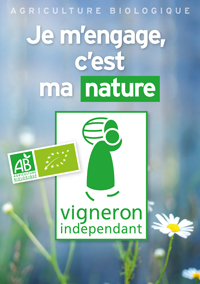 It was a pleasure to welcome you to the domaine and allow other people to discover our wines.